Saffron Gold, Earth Brown, Mist Grey and Black Vinyl. 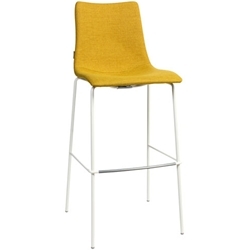 Kitchen bench 660mm stool and matching side chair also available. Features: Discontinued line 1 only available @ $88.00 inc gst. Top Colour: Walnut 12mm compact laminate top. Frame: Mat Black powder coated steel. 1.8 mm x 18 x 18 mm square tube. Dimensions: 800 mm x 400 mm x 363 mm high.